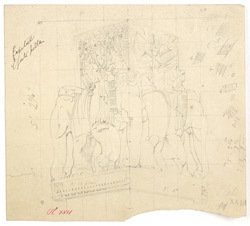 Pencil drawing by Frederick Charles Maisey of the capital on the north end of the lowest architrave of the East gateway of the Stupa of Sanchi. This is the squared-up working drawing for the final plate XVII published in Maisey's 'Sanchi and its Remains' of 1892. Lieutenant Maisey spent the cold seasons of 1849-50 and 1850-51 at Sanchi to prepare an illustrated Government report of the antiquities of the site. He was joined by Major Alexander Cunningham in 1851. The great Stupa of Sanchi is the finest example of monumental architecture of the Shunga era. Situated in a peaceful and meditative site crowning a hilltop, Sanchi was ideally located in proximity to the prosperous city of Vidisha. The foundations of this monastic centre were laid by the emperor Ashoka (reigned circa 269-232 BC) who built the original stupa and erected a monolithic pillar in the third century BC. The stupa was later enlarged and encased in stone around the 1st century BC under the Shungas and four magnificent gateways or toranas were added at the cardinal points. These consist of square posts crowned with a set of four lions, elephants or pot-bellied dwarfs, supporting three curved architraves with scrolled ends. They are completely covered with relief sculptures depicting Jatakas (stories of the Buddha's earlier incarnations), scenes from the life of the historical Buddha and Buddhist symbols.